“To leave is to die—a bit.” This French proverb came to my mind the other day when C., my former Riverside Drive neighbor, called to congratulate me about a magazine article extolling America’s Medicis: The Rockefellers and Their Astonishing Cultural Legacy. 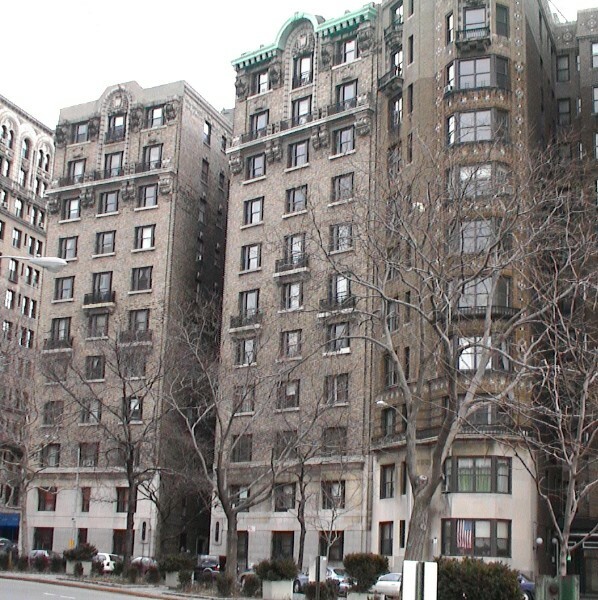 My husband and I left 788 Riverside Drive seventeen years ago, yet I almost immediately asked C. about “my apartment.” “A nice young family lives there now,” he said, “and they pay about $5000 rent a month.” This is about 50 times what we paid for that very same space when we moved there in 1956. To us, our $102 rent seemed princely. Even now I miss the apartment’s grand, 24 by 16 foot living room, the wood paneled dining room, the eighteen-foot ceilings, the old parquet floors, the wide hall and the enormous glass doors separating the various public rooms. 788 dates from 1911. Schwartz & Gross designed it for New York’s elite. Its long-forgotten name of Rhinecleff Court, the service bell embedded in the dining room floor, the butler’s pantry and the maid’s room all attest to its glorious past. I always wait for Christopher Gray, New York City’s historian, to feature this forgotten corner of New York in his NY Times column, Streetscapes. When we moved into 788 I was about to give birth to my second child. The neighborhood was filled with young intellectual families resisting the siren call of the suburbs, where kids could play baseball and women could devote themselves to the care of their large families. Our friends included musicians, painters, teachers, dancers, writers, and university professors, and some of us even became quite prominent. We had a rich social life, though our purses were lean. We worried about the safety of the neighborhood and saw to it that our kids went to elite New York City public schools. The friendships we forged would last a lifetime. I shared this year’s Christmas dinner with four of the people I met then. The 1950s marked the beginning of the women’s movement–Betty Friedan’s The Feminine Mystique would only be published in 1963–but my friends and I honed our skills or began building careers in spite of prevailing prejudice and obstacles. We organized our own homegrown nursery for three-year olds, and made other makeshift arrangements so that we had some free time to work. We cooked fancy French food for one another, dressed up for New Year’s Eve, and hung out in each other’s domiciles; our children profited from having multiple moms. the Audubon Terrace adorned with sculptures by Anna Hyatt Huntington, the location of a series of small museums built during the first quarter of the twentieth century. When my children were small we spent many a rainy Sunday at the Museum of the American Indian, whose collection is now divided between the old customs house at the Battery in New York and the National Museum of the American Indian in Washington. Many of the museums, like my friends, eventually moved elsewhere. The Hispanic Society of America, with it incomparable collection of Spanish paintings and artifacts remains between 155th and 156th Streets in Manhattan, and is well worth a visit. In 1994 my husband and I abandoned 788 and moved to Brooklyn Heights, another one of New York’s historical neighborhoods. It too was hard hit during the Great Depression when many of its single-family homes became single room occupancies. Because of its proximity to Wall Street, it recovered much earlier than lower Washington Heights. My current apartment house dates from 1925. It is about half the size of the one I left and is filled with young families. Every year we welcome one or two new babies. In the morning nannies come and the moms goes off to work. Fresh Direct and various restaurants deliver food. Dads seem almost as harangued as their wives. Starting with kindergarten, everyone is worried about getting their kids into the right schools, and of meeting the escalating management fees. It all has an aspect of déjà vu, except that now I am a spectator rather than a participant. beacon of freedom in a darkening world. This entry was posted in Uncategorized and tagged anna hyatt huntington, audubon terrace, brooklyn heights, christopher gray, great depression, hispanic society of america, museum of the american indian, new york city, new york city history, nyc history, nyc neighborhoods, rhinecleff court, riverside drive, streetscapes, washington heights. Bookmark the permalink. Thank you for a most serendipitous and enjoyable piece. I came upon your blog while searching for “788 Riverside Drive.” This was my husband’s first home, and I’ve heard my mother-in-law speak frequently and fondly of their apartment there. They were on the third floor in the ’40’s and were very happy there. I’ve printed your piece to share with her, and it will be such a treat for her to hear of your memories as well. Thank you. Your article really touched home, as 788 was my first – as a baby (1950) we were on the first floor, actually half a story below that. Next was apt 8A until 1956 when we moved to Valley Stream. By any chance was that your place?? Since 1971 I’ve lived in southern Israel and I am determined to take my grandchildren to see the neighborhood.